Last week I wrote about the non-native Tiger Lily (Lilium tigrinum or Lilium lancifolium) from Asia. I wanted to follow-up that post with one on the native Michigan Lily (Lilium michiganense). I’m fortunate to have the Michigan Lily in my rain garden area, but I don’t always get to see all of them bloom each season. This year I got to see only two blossoms; the deer like them, too. Both the Tiger Lily and the Michigan Lily have blossoms which hang downward with gracefully recurved tepals*. They both have orange blossoms with spots. They both have lance-shaped leaves. They both have a main sturdy stem on which stalks project to hold a single blossom. And they both have long stamens on slightly spreading, curved filaments with showy anthers. But there are differences. Unlike the alternate leaves of the Tiger Lily, the Michigan Lily has leaves that whorl around the stem. The seedpods are quite different also. Where the tiny round bulbets of the Tiger Lily grow around a hairy stem, the native Michigan Lily seedpods form at the tip of the stalk in place of the blossom. They are white, three-lobed pods which contain flat seeds with thin papery wings. The blossoms, too, are slightly different with the Tiger Lily’s being the largest at more than 4″, while the Michigan Lily is smaller at 3″. Both are unscented. The anthers are different with the Tiger Lily’s dark reddish brown anther’s being the largest at 3/4″, while the reddish brown anther’s of the Michigan Lily are typically less than 1/2″. 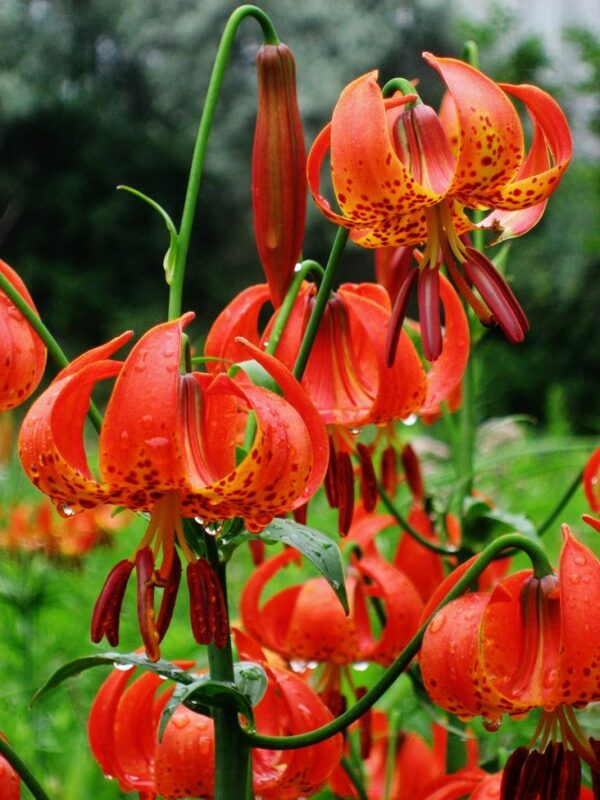 Unlike the Tiger Lily, the native lilies are quite attractive to hummingbirds and insects such as Sphinx and Hummingbird moths and the larger butterflies such as Monarch, Great Spangled Fritillary and Spicebush Swallowtail. There is also a good variety of larvae that feed on the stems and leaves, along with the usual variety of varmints. *The term tepals is used when the sepals and petals look the same and grow together in such a way they look like one bloom. In this case three sepals and three petals make up the bloom. Note: While preparing this post, I realized that the second native lily called the Turk’s Cap Lily is not native to Wisconsin.